Apprenticeship Scheme Will Create New Forest! The land, at a bend in the River Clyde known as Cuningar Loop, has lain derelict for more than half a century. Clyde Gateway, the regeneration agency, and Forestry Commission Scotland plans to transform the eyesore into a 37-acre park that will be used by more than 100,000 people a year. A new pedestrian bridge will link the woodland directly into the Athletes Village, which will be converted into housing for the public after the Commonwealth Games. The new park, which will be in South Lanarkshire, will be close to Rutherglen and directly across the river from Parkhead and Dalmarnock. The plan is to create a mosaic of native woodland, open grassland and meadows with places to play and relax. A community ranger will engage with people through a volunteer group and link up with schools to encourage them to use the woodlands for outdoor activities. Trails and picnic areas will be provided and visitors will be able to walk or watch the wildlife. 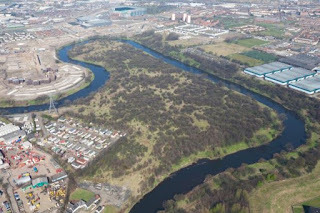 The area will also be used by professional sports people for outdoor and river training, with links to the Emirates Arena and the Sir Chris Hoy Velodrome.